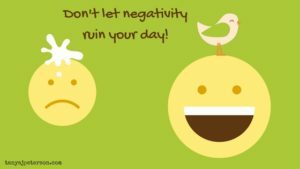 Does negativity sometimes ruin your day? Complaints, anger, discontent, and intolerance for differences of opinion are overwhelming. This negativity is omnipresent. It’s on the news, on social media, and in our communities, neighborhoods, and homes. Often, people don’t treat each other with genuine kindness; this can be intentional or, more frequently, unintentional, the unintended consequence of being surrounded by negativity. All of this is overwhelming and exhausting. There’s a lot that is out of our control, but there is a lot that is within our control. Below, you’ll find eight ways to keep negativity from ruining your day. When I was a new high school teacher, just out of college, I had a colleague who was one of the most positive people I had ever met. Yes, he had ups and downs, good days and bad, but his external world didn’t shake his inner, core happiness. He shared one of his life approaches with me: whenever he had a negative encounter with a student or a parent, he purposefully chose two students to whom to express his appreciation, and he’d follow that with a positive phone call to their parents. In this way, he was choosing a path in which negativity wouldn’t ruin his day. I’ve taken this approach in my own life, and it’s one of the ways I remain genuinely positive and happy despite problems and challenges—and despite all of the overwhelming negativity in the world. There two important components to this. One is perspective. How we conceptualize our world forms our foundation. For the above-mentioned teacher, focusing solely on difficult students would eventually begin to cloud his perception of “teenagers” today. By choosing to place his focus on the positive, he kept negativity from ruining not just his day but his outlook on life, career, and people. The other component is action. Action reinforces our perspective, and it gives us control over our own life. Because action is vital in keeping negativity from ruining your day, I offer eight ideas for doing just that. Lend a hand. Offer someone a ride. Hold a door. Offer to help a parent in the store when their toddler is wailing. Have a conversation with a cashier. Or anyone else for that matter. Rather than just waiting for your groceries to be scanned so you can pay and leave, have a genuine conversation. Start with a compliment or a show of appreciation (are they efficient, careful with your eggs, etc.). Leave a note. Make a habit of placing positive messages on windshields or in mailboxes. Compliment someone’s beautiful yard or leave an inspirational quote. Mail a card. Writing, by hand, short notes and mailing them to people you know brightens your day and theirs. Again, show appreciation, gratitude, compliment them, and/or write an inspirational message. Grow flowers. And care for them, too. If you have a patch of yard you can turn into a little garden, that’s great. Playing in the dirt, nurturing flowers and other life, is a wonderful way to release the day’s negativity. If you don’t have a yard for this, flowerpots work well, too. Volunteer. Do something you love to make your world a little better staves off negativity because it gives you a sense of control over your corner of the world. Appreciate yourself, too. Negativity can make us hard on ourselves. Make sure you notice the good in yourself the way you are noticing the good in others. Leave yourself notes, either on Post-Its around your home or contained in a journal. Appreciate yourself, and have gratitude for who you are. Dance. Create a positive, inspirational playlist and dance like no one’s watching. It’s exercise that will regulate your stress hormones and improve mood in a playful way. It’s a chance to take the world, and yourself, less seriously. You can’t always control the negativity around you, but you can control what you do about it for your own happiness. Connect with others and yourself in order to keep negativity from ruining your day. Make great moments in your day, every day.